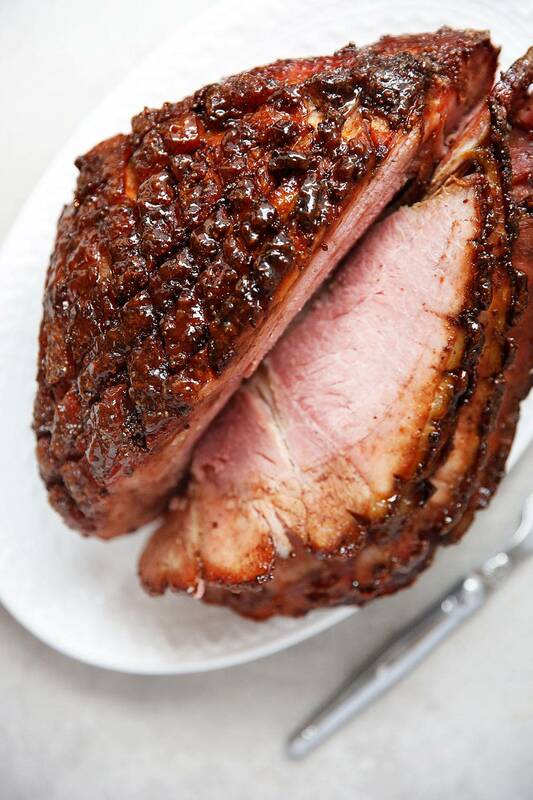 This Maple Glazed Ham is the perfect roast for any celebration! It’s relatively simple to make, made using only handful of ingredients, and is the perfect mix of salty and sweet. The glaze contains no refined sugars and will have all your guests swooning! This is the first time a whole roasted ham is appearing here on LCK, and I won’t lie this Maple Glazed Ham has been totally worth the wait. It’s the perfect mix of salty, sweet and tangy and truthfully was really easy to make! It is definitely a centerpiece-worthy cut of meat and will go perfect this upcoming holiday season along with some other LCK sides like these Honey Glazed Carrots, Garlicky Blistered Green Beans or our Classic Mashed Potatoes. The most important part of this recipe is of course, the ham! To start we are talking about a fully cooked ham, usually marked as “ready-to-eat.” There are a lot of choices out there ranging from boneless, spiral cut, cured, smoked, etc. First and foremost we recommend purchasing a ham that is free of antibiotics and nitrates. After that you can choose between bone-in, semi-boneless or bone-in. 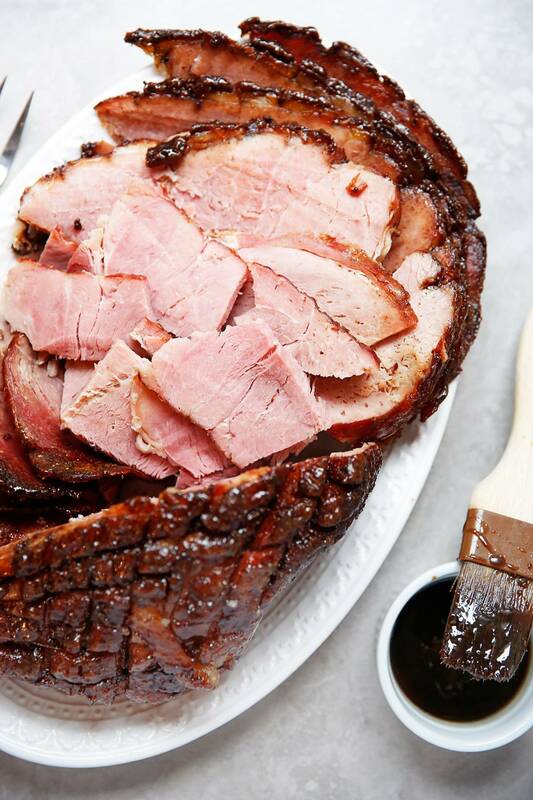 We used a bone-in spiral sliced ham in this recipe because we REALLY wanted to be able to use the ham bone in other recipes. We also feel like a spiral-cut ham is easy to serve because it is already half-way cut. Beyond this it’s really all about your personal choice. The ham is already fully cooked so the only cooking task here is to “warm” it up and make the glaze. 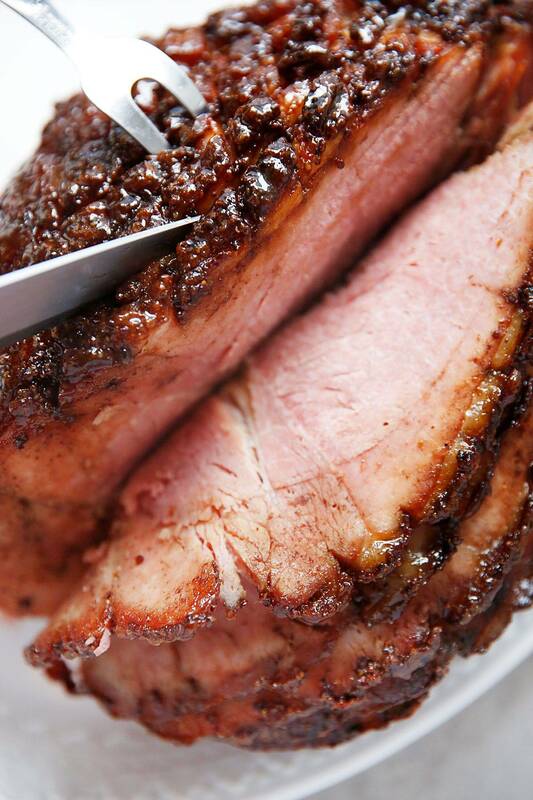 It is recommended that you heat up a fully-cooked ham to 140ºF (we use our kitchen BFF, the Thermapen). If this is your first time cooking a ham you may be surprised about how long the cooking time is! It takes a while to reach the 140ºF temperature because most of the time these whole hams are large in size! Our 10 pound ham took about 3 hours to fully cook. So while this recipe is not hard to make, it takes a little bit of time so plan accordingly. First heat up the ham, which is covered in foil, in a roasting rack/pan with water in the bottom to help keep the moisture in. Cook for about 2-1/2 hours, or until the ham is about 120ºF. While that is in the oven you combine all the glaze ingredients in a saucepan and bring it to a boil. Around the 2-1/2 hour mark take out the ham to glaze and return to the oven for 30 minutes or so. The ham is done when the glaze is nice and sticky and that ham has reached an internal temperature of 140ºF. Let the ham rest for about 20 minutes before serving. You can serve with additional glaze if you desire. Let ham sit at room temperature for about 1 hour before starting. Pre-heat oven to 325ºF and place an oven-safe rack inside a roasting pan. Place enough water to come up about ¼” in roasting pan. Place the ham fat side up on the rack. Score the ham diagonally with a sharp knife, and cover tightly with foil. Place in oven and bake for 2-½ hours, or until the ham registers an internal temperature of about 120ºF. Meanwhile make glaze: Add maple syrup, coconut sugar, dijon mustard and spices in a pot and bring to a boil. Set aside. Remove ham from oven and remove foil. Brush the top of the ham liberally with maple glaze and return to the oven for about 30 minutes, or until the ham has reached an internal temperature of at least 140ºF. When ham has reached the correct temperature remove from oven, and glaze the ham one more time. Let sit for 20 minutes before slicing and serving. If you have a different sized ham, simply change the cooking time. You want to be cooking the ham about 18-20 minutes per pound. Wow this looks delicious! I love a glazed ham! we just made butcher box ham with maple mustard glaze too! Can’t get enough. It’s the bEST HAM EVER! 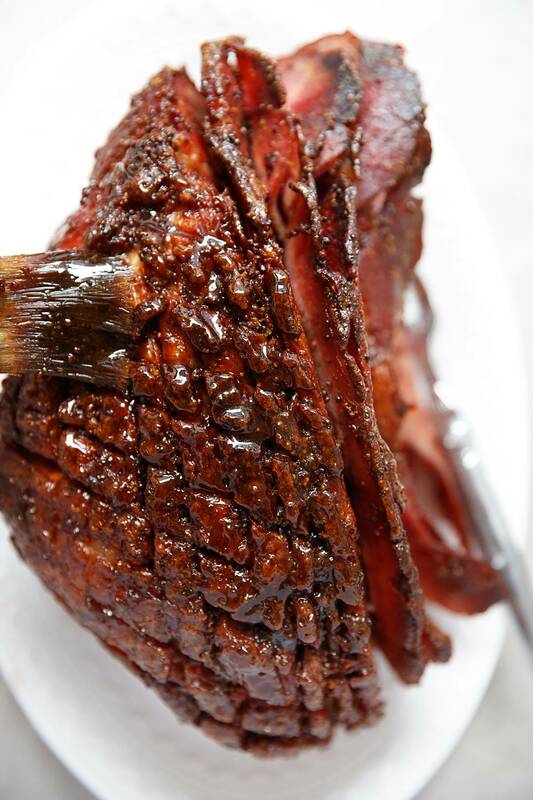 Mmmm…nothing says the Holidays like a glazed ham! Yum! And definitely love making soup afterwards with the bone! Wow, I’ll be having a lot of ham this week and I hope it looks like this!! I had never made a glazed ham before. This was absolutely amazing. Even the picky eaters in my house loved it! This is now our favorite way to glaze our ham! So yummy! New tradition to make the ham with this glaze.Thanks for the recipe.